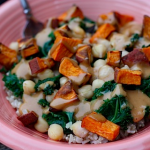 Rice bowls with blanched kale, baked sweet potatoes and chickpeas in a creamy almond sauce. Chop sweet potatoes into 1/4 inch chunks, sprinkle with sea salt and bake for 30 minutes. Blanch kale in boiling water for 3 minutes, remove kale from water with a slotted spoon and place kale in an ice water bath so it stops cooking. 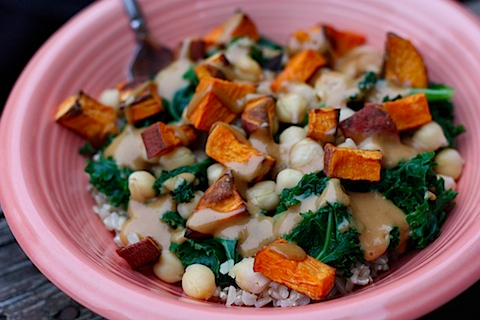 Drain and squeeze the water out, chop and set the kale aside. Prepare creamy almond sauce and set aside. Drizzle each bowl with some of the creamy sauce and enjoy!